Excellent ideas! The perfect description of the main aspects of the whirlpool galaxy gives great confidence in fluid gravitation, which can be applied to elementary particles as Norman Page suggests here. Sao Paulo is ranked 50 in the world by webometrics, 101 – 150 by Shanghai, 143 by QS and 251 – 300 by Times. It has 88,261 students in various campi. It was founded in 1934 and its law school dates back to 1827. It is one of the best universities in Central and South America. David Bohm (co author with Jean-Pierre Vigier of a famous paper), taught there and left a legacy of thought different from the standard model. The Aharonov Bohm effect is named after the Wolf Prize winner Yakir Aharonov and David Bohm, who was another victim of McCarthyism, both political and academic. UFT88 is a famous paper in its own right, because it refutes the Einstein theory of general relativity through use of torsion. It has come to be regarded internationally as the definitive paper of its type, having been read in all the best places for almost a decade. It should be read with UFT99, 109, 313 and 354, together with the definitive proofs, which simplify and go to the essence of UFT99. Among the ECE School of Thought (probably the majority now), the Einstein theory is thoroughly obsolete in many ways. One need only glance at the UFT papers to see that. It has been replaced by ECE2, which has unified several subject areas of physics. ECE2 provides an elegant explanation of the whirlpool galaxy using its latest development, fluid gravitation. Einstein and Newton fail completely to describe a whirlpool galaxy (see “Principles of ECE”, in press). This is given by eq. (7) and is proportional to the spacetime velocity field in the plane of the galaxy. There is a magnetogravitational field in the axis perpendicular to the galactic plane. Therefore fluid gravitation gves a perfectly self consistent explanation of all the major aspects of a whirlpool galaxy, including the hyperbolic spiral orbit of stars, the large mass at the centre, and the velocity curve. This is the result of ECE2 unified field theory, in this case gravitation unified with fluid dynamics. The production of the book has started at “New Generation” in London, the leading joint venture publisher in Britain. The four authors will retain copyright and the book will have an ISBN number. It will appear in softback, and I have arranged for one complimentary copy to be sent to the National Library of Wales, which has a complete collection of my books, my Ph. D. Thesis and my D. Sc. Thesis, and which will shortly archive www.aias.us and www.upitec.org using Wayback Machine software. The sites will be featured by the National Library of Wales and British Library as being important to science and culture, notably poetry in both languages, but also many other cultural features. I will send the address of Dr. Douglas Lindstrom in private so that he can be mailed one of my complimentary copies direct from the publisher in London. It will be available from all the best bookshops, such as Amazon and Waterstones, and will be advertized on www.aias.us and http://www.upitec.org. It has already been read about twenty thousand times in its preparatory stages, and at all the best universities, institutes and similar around the world. I would like to thank all who helped with the production of the book, the lodestone of avant garde physics. In terms of art, its publication is similar to the Impressionist Exhibition in Paris, or the appearance of Rodin’s statue of Balzac. In terms of music, it is similar to Sacre du Printemps (The Right of Spring) by Stravinsky. All these happenings caused a riot. The book will be very reasonably priced. In terms of science it is similar to the appearance of relativity or quantum mechanics, a great sea change in thought. There was the usual intense international interest, the final returns for September will be sent out as usual in about two days’ time. Seconded, Dr. Horst Eckardt put a great deal of hard work into the camera ready copy. Many thanks to all concerned. Co President Gareth Evans refers here to the description of “Molecular Dynamics” (Wiley Interscience 1982, produced from Aberystwyth) by Prof. Sir John Rowlinson, F. R. S., from the Physical Chemistry Laboratory at Oxford. A massive effort by Horst and congratulations to all authors. A “magnificent” book (to borrow a quote from the past!! This is the camera ready copy of the book, prepared by Dr. Horst Eckardt in publishable format. I will telephone you shortly after 9.00 am to give funding details. In the previous e mail I submitted the front and back covers. The front cover was designed by an artist colleague of Dr. Horst Eckardt. This is the typescript. It is formatted to 17cm x 24cm which is a standard book format, for example like Marion and Thornton. The cover has still to be adopted to this format. I will print my exemplars with hard cover. This matters for determining the total cover layout. The typos in the script have been corrected. Myron, when you get an ISDN number, let me know, I can include it in the typescript then. BTW, the version on the web is letter format, for private printing. Ready to submit the typescript to “New Generation” at any time convenient to the co authors. 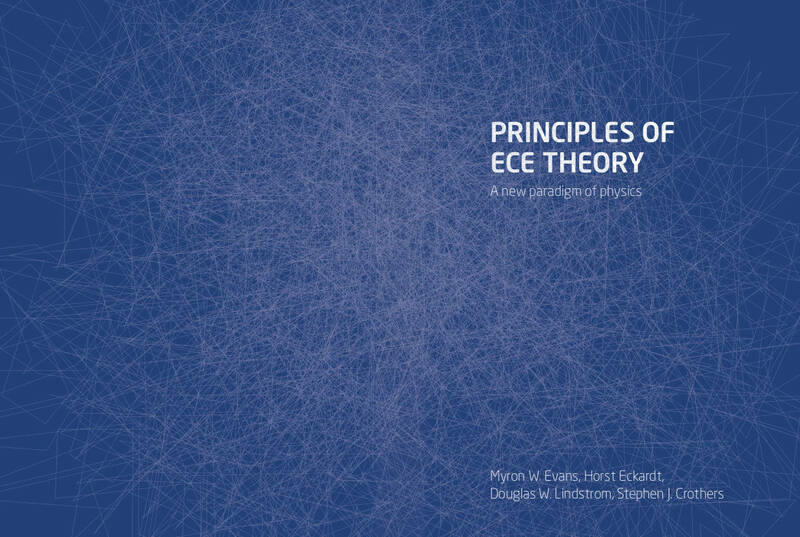 I am submitting “Principles of ECE” for publication. These are the front and back covers. In the next e mail I will submit the text. I changed a comma in the backcover text to a full stop (was a typo) in front of “Both sites are archived…”. Concerning the cover: My artistic colleague was on holiday, he can now finish the design. He would completely design forefront and back cover with the text. You can use it for New Generation Publishing. I appended the cover design, text (editor name etc.) has still to be adopted. It is a graphical visualization of the “fabric of spacetime”. I hope it is o.k. OK thanks, change made as attached. of several of the ECE papers, and is a leading ECE scholar. I would just like to check that this is the final version with back page material added. It will be submitted at the end of the month as a joint venture publication with the leading British venture publisher, “New Generation” of London. Horst will also arrange for a few copies to be published in Berlin. At present the monograph is being read 5,676 times a year off www.aias.us and www.upitec.org. I would like to thank all who contributed to this book, in alphabetical order: Steve Bannister, Steve Crothers, Horst Eckardt, Alex Hill, and Doug Lindstrom, toegther with all the staff of AIAS / UPITEC. It has already been archived permanently on the Wayback Machine (www.archive.org) and will shortly be archived permanently at The National Library of Wales and British Library (www.webarchive.org.uk) using Wayback Machine software. The two sites www.aias.us and www.upitec.org will be featured as sites of importance by the National Library of Wales / British Library. The cover design is being prepared by an artist commissioned by Horst Eckardt. The wind speed all over mainland Wales today is less than 7 – 9 mph, with 12 mph off the coast of North Wales. So the output from win turbines in Wales is negligible again. The wind policy is the worst industrial fiasco in history. The equivalent of 117,707 printed pages was downloaded during the day (429.158 megabytes) from 2,650 downloaded memory files (hits) and 521 distinct visits each averaging 3.7 memory pages and 10 minutes, printed pages to hits ratio of 44.42 for the day, main sspiders cnsat(China), google, MSN and yahoo. Collected ECE2 1848, Top ten 1796, Collected Evans / Morris 924, F3(Sp) 807, Collected scientometrics 609, Principles of ECE 269, Barddoniaeth / Collected Poetry 262, Eckardt / Lindstrom papers 244, Autobiography volumes one and two 235, Collected Proofs 200, Evans Equations 144, UFT88 125, Engineering Model 122, CEFE 93, PECE 83, UFT311 60, UFT321 44, Self charging inverter 41, Llais 38, List of prolific authors 25, Three world records by MWE 19, Lindstrom Idaho lecture 15, UFT313 40, UFT314 36, UFT315 40, UFT316 32, UFT317 40, UFT318 48, UFT319 48, UFT320 35, UFT322 51, UFT323 41, UFT324 67, UFT325 54, UFT326 48, UFT327 35, UFT328 47, UFT329 49, UFT330 29, UFT331 38, UFT332 34, UFT333 38, UFT334 28, UFT335 32, UFT336 31, UFT337 32, UFT338 28, UFT339 29, UFT340 35, UFT341 26, UFT342 27, UFT343 32, UFT344 42, UFT345 41, UFT346 58, UFT347 47, UFT348 42, UFT349 41, UFT351 57, UFT352 61, UFT353 63, UFT354 68, UFT355 84, UFT356 59, UFT357 39 to date in September 2016. Ministry of Buenos Aires Province Argentina UFT16; University of Western Australia Proof Two; Institute of Physics University of Sao Paolo Brazil UFT88; City of Winnipeg UFT Section; IParadigms California UFT2(Sp), UFT171(Sp); California Institute of Technology UFT305; University of California San Diego UFT175; Italian National Institute for Nuclear Physics (INFN) Milan Diplomatic Objection to ‘t Hooft by AIAS Co President Gareth Evans; Bezeq International Data Centre extensive download; University of Warwick extensive. Intense interest all sectors, updated usage file attached for September 2016. You are currently browsing the Dr. Myron Evans blog archives for September, 2016.